"In this Sign Thou Shalt Conquer"
When his rival Maxentius invaded the Roman Empire, Constantine marched as far as the Milvian Bridge to meet him. Yet he was concerned whether he would defeat Maxentius. Then one night, Constantine had a vision: he saw the Cross of Christ glowing in the heavens, surrounded by golden rays. Angels pointed to the Cross, saying to him: "In this sign thou shalt conquer!" Constantine was a merciless Roman emperor. Not only did he see to the execution of his coruler, Licinus, he also condemned close relatives to death, among them his son Crispus and his second wife Fausta. Despite his ruthlessness, however, Constantine the Great supposedly secured a place in Heaven, a saint who is still venerated in the Greek Orthodox Church. Although Constantine tended to sacrifice morals to expediency, he later became a key figure in the development of Christianity as a world religion. Legend has it that it all started with a dream. When Emperor Constantius died in AD 311, there were two claimants to the throne: Constantine and Maxentius. On 28 October 312, at the Milvian Bridge, which spanned the Tiber north of Rome, these men fought the decisive battle over the succession. Constantine is said to have told the Church historian Eusebius of Caesarea that, on the day before the battle, a Cross of light appeared to him in the heavens, bearing the inscription: "In this sign thou shalt conquer!" Yet according to Jacobus de Voragine, the leading medieval compiler and specialist on the lives of the saints, Constantine had his vision at night in a dream. 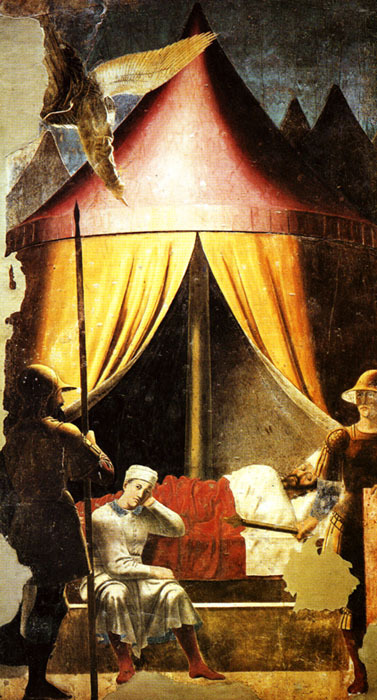 It was based on this report that the Italian Renaissance painter Piero della Francesca depicted the vision of Constantine at night, rather than by day. 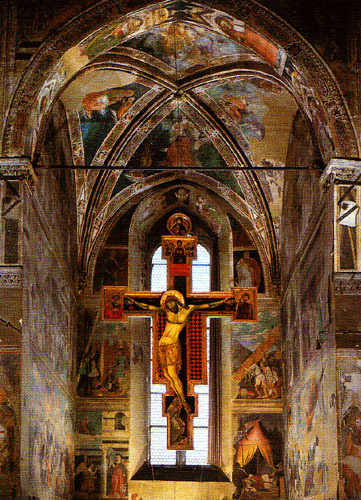 The artist was commissioned by the wealthiest family of Arezzo to paint a fresco cycle depicting the Legend of the True Cross for the choir in the church of San Francesco, and The Dream of Constantine is one scene in this cycle. After the vision, it is said that Constantine had the symbol of the Cross painted on his soldiers' shields, which led them into their victorious battle. It is impossible to know whether his vision and the victory really led Constantine to convert to Christianity, but, during his reign, Christianity was legally established as a religion, enjoying the same status as the ancient pagan belief in the gods. From 312, Constantine also made impressive donations to the Church and had the first important Christian churches built. Among them were Old St Peter's in Rome, the Church of the Holy Sepulchre in Jerusalem and the Church of the Apostles in Constantinople, the foundation of which today supports Hagia Sophia. Constantine also introduced Sunday as a day set aside for church services and promoted the Christianising of public life by appointing Christians to high office in Rome. In fact, some of his legal reforms further suggest a Christian influence: criminals were no longer permitted to be branded on the face and the corporal punishment of slaves as well as the selling of children was restricted. In 325, in what is now the western Turkish city of Iznik, Constantine convened the first synod of bishops: the "Council of Nicaea", which stands out in ecclesiastical history. For all that though, the Emperor did not consent to baptism until he was on his deathbed.